DOESN'T EVERY CLOSET NEED A CHANDELIER? How pretty are these closets? I know you all have to have chandeliers, ottomans and over-sized mirrors propped against unused wall space in your closets, don't you??? I could only wish my closet was this organized. No matter how hard I try to keep things folded properly nothing stays that way. Oh sure, I've replaced all my hangers to match, but inevitably the dry cleaner hangers make their way back in. They get twisted and tangled especially when you're in a hurry getting dressed. 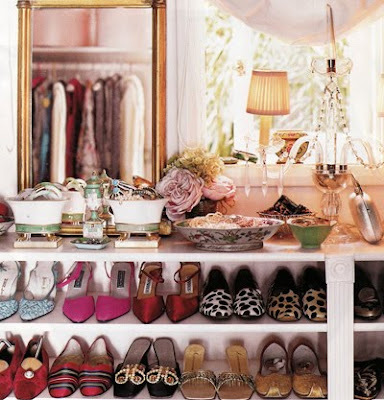 So my wish for 2010 is to get my closet to look this way. Hmmm, I just need to find the right chandelier, oh and ottoman too. 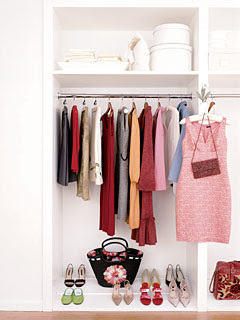 Does your closet look this way??? 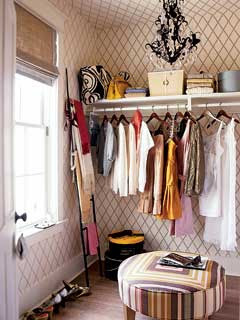 Oh, these closet images make a girl drool all over herself! I especially LOVE the closet with the blue ottoman complete with the puppy! I'll visit again soon! Come over to my blog anytime! I think I have died and gone to closet heaven! 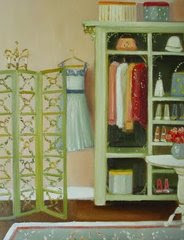 These are the closets I fantasize about, one can always dream! thank you for your comment on my Dad's Wood Sculpture... it made his day!! !